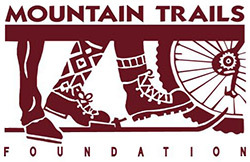 Mountain Trails Foundation is a non-profit organization that is Park City’s trails advocate. We are dedicated to promoting local trails for non-motorized, recreational use. In addition, we hold annual events like the Mid-Mountain Marathon (trail run), Tour des Suds (mtn bike) and the Round Valley Roundup (x-country skiing), as well as many volunteer trail care days. The long-term goal of the Mountain Trails Foundation is to provide the greater Park City community and its visitors with diverse recreational opportunities utilizing our seamless, year round trail system.